Even to mention this shot brings many a heart faint! Of all the shots around the green, this shot seems to bring more anxiety to the average weekend golfer than almost every other shot. Why is that? My theory from 40 years of teaching experience is that the handicap golfer fears this shot from failing to follow four fundamentals. 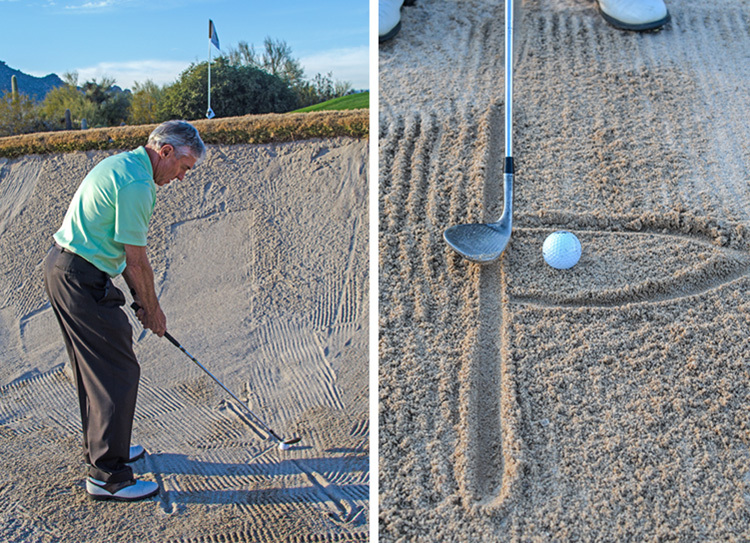 I’m not saying this is an easy shot, but if you apply the following six steps you will improve, even become comfortable — not fearful of tackling this green side bunker shot with a high lip looming in front of you. Open the face of your sand wedge. Yes, you’ve heard that before, but do you know why? To create more loft and bounce. When the face opens (Photo 1) the loft of the club increases. A standard sand wedge is 56 degrees loft. For every degree you open the face you increase the degree of loft. With this shot I am opening the face 20 degrees, so my “effective loft” is now 76 degrees. Special note here: Opening the face is not leaning the shaft backwards. For a right-handed golfer, opening the face is pointing the bottom edge 20 degrees to the right of the target line. When you open the face you increase the bounce. Bounce is the word given to the rear, trailing edge underneath on the sole of the sand wedge. Some get confused with the flange, which is the width of the sole. Bounce is the degree of the slope of the back edge of the sole/ flange. The ball is placed two inches forward of the middle of your stance. 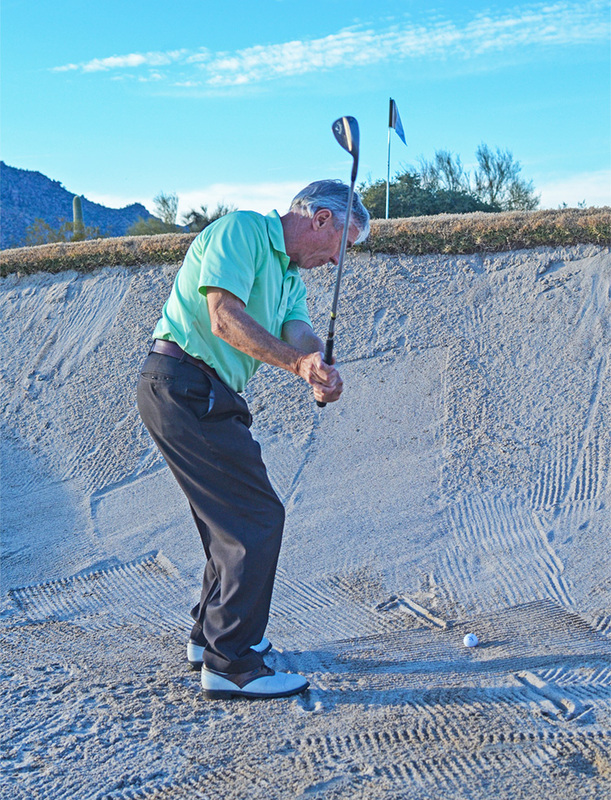 Although it is against the rules to draw a line in the sand before you swing, and a two-stroke penalty, visualize that line two inches behind the ball (Photos 2-3). That is where the bounce edge enters the sand and the sand divot starts there, moving forward. So, you are splashing the sand starting the divot in the middle of your stance. A shallow divot is ideal. You may have heard the cliché of a “dollar bill divot,” but it remains a good mental image of a shallow divot. With the club face open to the target line or flag, open your body alignment and (Photo 4) stance the same amount — in this case 20 degrees to the target. At this point most golfers open their body too much. Only open (aiming left of target) the body the same amount that you’ve opened the face. For some students I don’t even let them open the body. It’s the club face that strikes the ball, so opening the face is the most important thing here. Now the next statement is a big key to success: Swing along your body line. Not at the flag, not inside, not across the ball. Swing along your body line as if you were pitching the ball from grass for a 35-yard pitch. I use this analogy to get people to make a normal swing, the length and speed you may need to pitch the ball 35 yards through the air. Notice how the club has swung up and along the body line and yes, my chest is turning (Photo 5). This shot is not “all arms, keep your body still.” No shot should be all arms! Look at the club face at the top of the backswing — the face is open and the shaft is over my rear shoulder (Photo 6). We may call this a three-quarter swing as opposed to a full swing. Simple keys could be: turn your chest 69 degrees, swing hands up and opposite my rear shoulder. Again, think of a 35-yard pitch shot with a sand wedge. The downswing is where most poor bunker players fail. Swing back down (where you went up) along your target line, which is NOT the flag. To swing along your body line, you are swinging 20 degrees left of the target. The lower body, legs and hips are so important here. Unwind and clear the hips, weight on left side. The sand divot is following along the stance/body line (Photo 7). This divot is 29 degrees left of the flag. Maintain posture and spine angle. The ball comes up and out on a cushion of sand (Photo 8). This greenside bunker shot is the only shot in golf where your club face doesn’t make contact with the ball. The ball is forced out, like a breaking wave in the ocean, on a wave of sand. 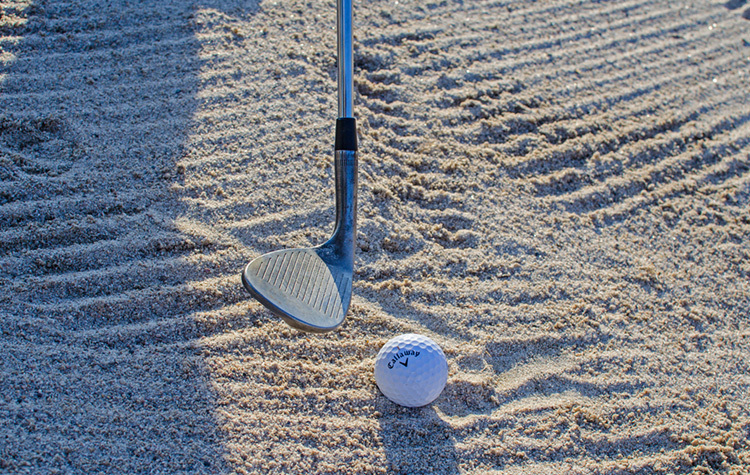 Feel to thump or splash the sand with the bounce edge of the sand wedge. 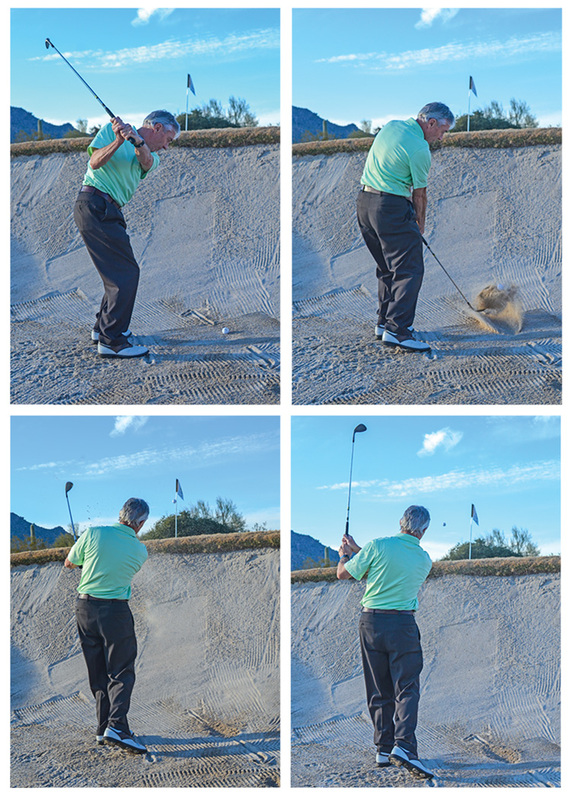 Splash the sand out of the bunker and the ball will follow. The follow through is left of target. The hips and chest are fully unwound. Weight is on the left forward foot. The club has swung through to finish over the left shoulder. (Photo 9). End result? A high soft shot up and over the lip, landing softly on the green. One final comment here. You must keep your swing speed up. 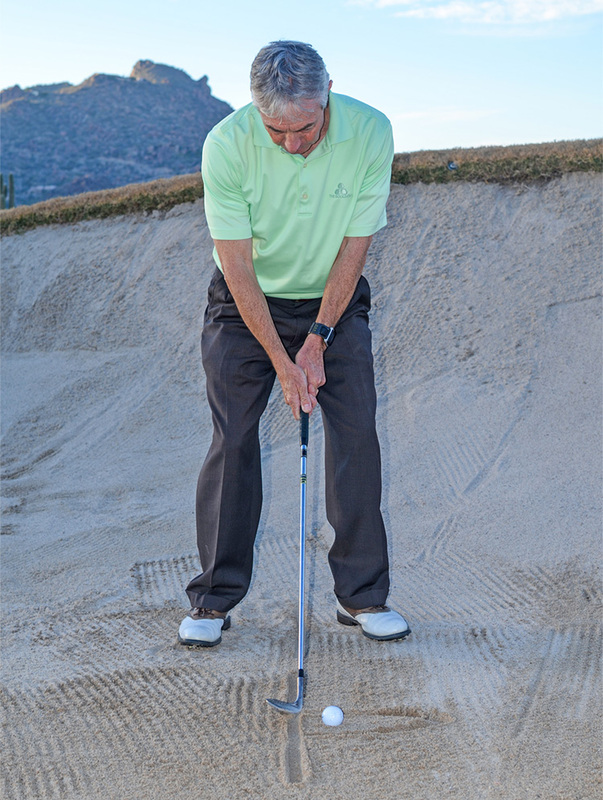 The club does not decelerate and dig the sand. The club is accelerating through the sand. Again, feel to pitch a SW shot from 35 yards and you will get the feel of the swing speed needed.